If you ever get very stoned and end up searching the Internet Movie Database for “dad,” you will find it’s actually a surprisingly popular title for films and TV shows. There are apparently dozens with the title, all ostensibly about dad(s), spanning across decades. There’s Dads (1986) and Dad (1989) and Dad (1997) and Dad (2005) and Dad (2010) and Dads (2013) and Dads! (2017). Add adjectives and nouns to the mix, and things get even more nuts. A quick scan of a few of the evocative titles: Ghost Dad (1990), Emo Dad (2013), Selfie Dad (2018), and Vampire Dad (2018). Too many dads! It’s baffling that such a simple, modest title could be so prevalent. But it’s kind of the perfect, vague way to convey the diverse range of complicated emotions w/r/t male paternity. And who are we kidding? It’s a helluva title. I started with the pilot episode of the sitcom Dads, starring Seth Green. It aired for one season before getting cancelled. The show follows two schlubs who run a video game company and give their dads jobs for some reason (who cares). The series was almost universally despised: It has a 15 percent rating on Metacritic and got mediocre ratings. Also, it was racist. Like, very racist. I was curious, as the pilot episode started, if the show could possibly be as bad as everyone said. It was. The jokes were paint-by-numbers sitcom humor, seasoned with racism and sexual harassment. Using a stopwatch, I timed how much screen time actually featured dads. Only 13:24.23 of its 21:59 minute runtime actually featured dads as characters, giving it a measly score of .613 dpm (Dads Per Minute). Disappointing. It’s a pretty boring show, featuring jokes about how annoying and unfashionable dads are. One notable detail is that the episode titles are all puns featuring “dad,” for example: “Dadism,” “Dadcoholic” and “Habadadery.” Get it? The first episode ends with a heartfelt message about how dads, although they can be very annoying, are really just trying their best. It makes you think. Despite how mediocre the show is, it clocked in at an impressive .919 dpm, making it the most dad-saturated item on the list. Unfortunately, without a full episode, I couldn’t record an accurate dpm rating. This is a film starring Ted Danson as an “always-on-the-run” executive who has to return home to take care of his ailing father, played by Jack Lemmon. It also stars Olympia Dukakis, Ethan Hawke and Kevin Spacey (RIP). 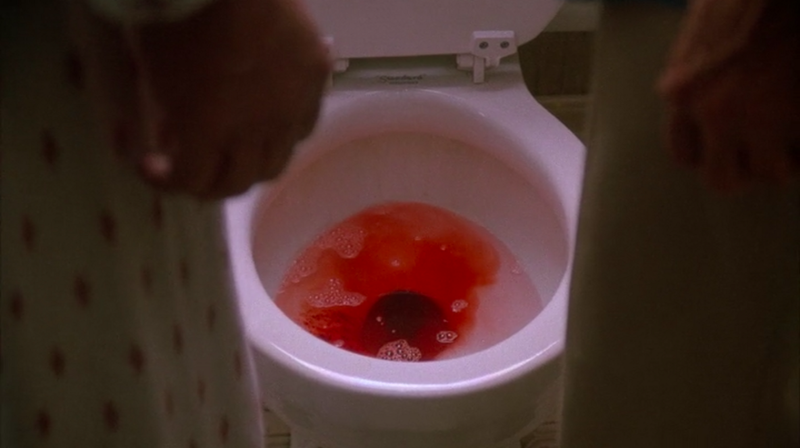 There’s a point about halfway through the movie (spoiler alert) where Lemmon’s character becomes alarmed by something in the bathroom and Danson races in to help him and discovers a toilet filled with blood. It was at this point that I realized I’d already seen this movie, decades ago, watching it on TV in the middle of the day during a school vacation. Anyway, this is actually a pretty okay movie, maybe overly sentimental but also sort of charming, especially because this kind of small, slow and kind movie doesn’t exist anymore. It also has a staggering .902 dpm. This show allegedly aired on ABC, but I can’t find a copy of it anywhere. The only evidence that it actually exists are its IMDB page and this short promo I found on YouTube. There aren’t even small pockets of fans lurking on the internet, as far as I can tell, which says a lot, because there’s a subculture for everything online, even for fringe fetishes like body inflation. So, no capsule review, no dpm rating. But: Isn’t there something unsettling about how a major TV show can just disappear like this, without anyone noticing? It really makes you wonder about the great churn of content being shoveled before us daily, infinite entertainment at all moments, and how all of it will get washed away over the years in the unceasing current of more content. How you (and by you I mean me here, obviously) can’t help but feel deeply depressed about this, not because a dumb sitcom like Dads is significant, but that if even this particular artifact of pop culture — one with millions of dollars and the star power of Barry Bostwick behind it — can’t survive in any meaningful sense, then what hope can we (and again, I mean me me me) have for the longevity of our own work? What’s the point of doing anything? Is this why we become parents/fathers, because passing along strands of DNA is the easiest, most reliable way to gain a symbolic immortality? Here we have yet another sitcom called Dads from 1997. It was apparently a big year for dads. It starred Rue McClanahan. It never got picked up. It opens with a bunch of jerks talking in a diner, Seinfeld style, and even though nothing they say is funny, they all smirk after they deliver their one liners. I hate them all. Honestly, I couldn’t get through this episode. Something something something, get a load of how many shows are called Mom!